A New Day For DNN Has Arrived. Sharp Look Is Here! Can you believe it?! DNN Con, ladies and gentlemen, inevitably came to an end. Wow, what a great event! We got to meet many of our clients and friends, learn a whole bunch, and reach out. It's pretty rewarding to see how known our brand has become. But keep the tears wiped away because we have an exciting announcement coming up to brighten up your end-of-DNN Con sorrows. After months of hard work… the day has finally arrived. Sharp Look is here! Sharp Look has launched in a shiny way, in our way, at DNN Con. Doing things a little bit differently is how we plan to roll from here on out. Not just to be different, but to do things the way we want them done. A huge thank you goes out to all of our beta testers. Your insightful feedback and comments have already been developed into Sharp Look 1.0 and more ideas are planned for Sharp Look 1.1 and beyond. Yes, your feedback matters and you are helping us build a better Sharp Look. We also want to thank everyone who has tweeted about Sharp Look. With your support we have been able to stay focused on our customers and the development of our products, rather than worrying about marketing aspects. Wondering why we built Sharp Look? Well, Sharp Look in its most primary form has been developed out of frustration. Frustration with the lack of options and support for the everyday DNN user and the small business owner that lacks the skill set required for successful development and design of their DNN site. So we had a core ambition. We wanted to solve the big problems in DNN to make it doing really well in the big world of CMSes. So we set out to build a framework. And in the end, we created something which we think will revolutionize DNN. Sharp Look will redefine how sites are created and managed by replacing the DNN administration controls with a sleek, clean, touch-friendly, interface. It will give you the joy of editing your design with simple yet powerful tools in the new mode for designers (besides the traditional View, Edit, Layout). Your portal’s unique styling will be under your control with all of its aspects. How cool is that?! With Sharp Look, we had one goal: to change the way you DNN. With that goal in mind, here are a few features we'd like to highlight. So whether you’re a novice or advanced developer, Sharp Look empowers you to quickly and easily build stunning DNN portals, providing a foundation that takes DNN to places you never thought it could go. We think is the easiest way to build and maintain a dynamic, template driven DNN portal. Let’s take a closer look at why Sharp Look is so sought-after and why you should use it to rock your web design world. With Sharp Look there's an extremely shallow learning curve. Why code while you can click? Sharp Look’s state of art technologies give you total control of most common elements on your DNN portal with just a few simple clicks. Themes and panes can be designed in the Layout mode without coding a single line. No ascx skinning, everything is skinned via admin UI. Sharp Look was built with simplicity in mind. If you're just getting started with DNN, the good news is that this may be all you need. No need to “learn” anything new or spend countless hours searching Google trying to figure out DNN. We've done our best to only include the customization options you need. With Sharp Look there's an extremely shallow learning curve. Sharp Look makes you to set your desired styling with ease. Each element defined in back-end can be styled with just filling the forms and setting the options. Your portal’s unique styling is under your control with all of its aspects. You know what you want your DNN portal to look like. So stop wasting money on design or time looking for DNN themes. Sharp Look will do everything you can dream. Custom designs no longer require you to hire another person. You can create a new look every time you get bored of your existing design - in a single night. When you produce several DNN portals a year, you need a toolset that helps you speed up without compromise. That's what we've built in Sharp Look. It will make you one of the fastest developers around. Sharp Look transforms the design and building of a DNN portal from a back-end process to a front-end experience, cutting a tremendous amount of time out of the site development cycle. You can have a complete site launched in less time than it takes to drive to a book store and buy a book on HTML or DNN. Sharp Look aims to be both fast and easy to customize, as it is built on top of Twitter’s Bootstrap framework, that you know and love, so everything looks clean and modern right out of the box. Plus, most web designers are familiar with Bootstrap at this point and know how to quickly use and build on its class names to style page elements. Sharp Look UI code belongs to the browser. By replacing the .aspx controls with client side code we made DNN much faster taking it to places you never thought it could go. Sharp Look is shipped with pre-made templates that you can use and edit with ease. 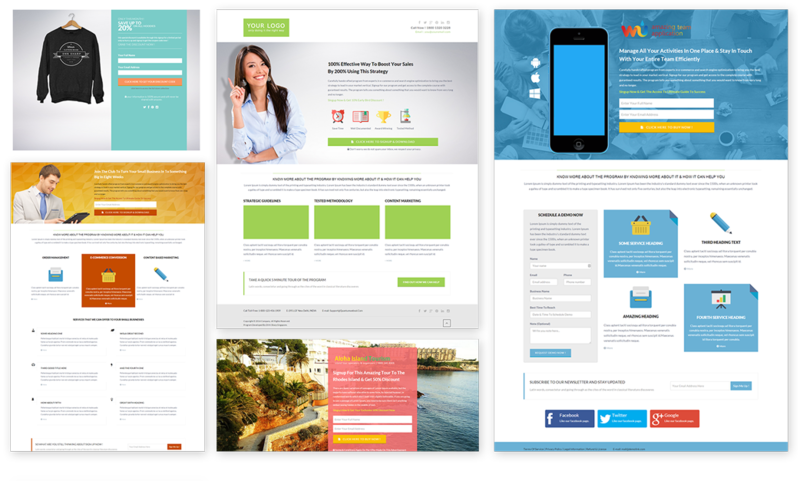 These templates are perfect for conversions of all kinds and can be used for every ocasion including high-converting landing page templates that will eliminate visual noise and distracting links, thereby encouraging visitors to focus exclusively on your content. You can instantly add them to your DNN portal and tweak them to your satisfaction and... Boom! Your DNN portal just got sexier. In addition, you can create any layout you want, instead of DNN themes that lock you into 2 or 3 pre-created layouts. Cool isn't it? Just imagine, a tool to give you total control of most common elements on your DNN portal with just a few simple clicks. A tool that brings us a step closer to a new paradigm of digital design, where the functionality and aesthetic are in complete harmony. You’ll be amazed when you find out of how easy it is to build everything you need to make your vision a reality on your DNN portal. Sharp Look will make your creative brain explode with the variety of designs you can do with it. And So, The Journey Begins! Sharp Look is here to stay. Those who won't miss out, will find themselves in a pretty profitable position. We are playing the long game and we are really glad that you have decided to join us on our journey. Simplicity, ease-of-use, and intuitive design is our goal. Yes, we will develop into a much more robust feature set as we grow, but never at the expense of usability or simplicity. We really want your thoughts on how we can make the magic happen for you, so please don’t be shy! We welcome everyone to the Sharp Look forum and look forward to including your ideas in our updated products, and to seeing how you change the way ideas are shared, taught and spread.